If you are interested in the energetic healing arts then this workshop is for you. This introductory series will get you started in learning the basics. Why am I drawn to certain crystals? How can I better access my higher energy to assist in healing? How do my thoughts affect my own chakras? This introductory metaphysical healing class trains you in techniques of soul-level work on the aura and chakras. It serves as the foundation for an eight part series of advanced healing techniques. In this eleven-week class, you will learn how to access your client’s soul codes and expand the aura and chakras into the fifth dimension and beyond. We will delve into the psychology of each chakra to facilitate self –healing, along with detailed study of crystals and spirit guides. These classes are taught infrequently and are an opportunity for personal growth. An extensive handout is included in this series. There are suggested additional materials available for purchase that will be discussed in week one. How is the body affected by the chakras? 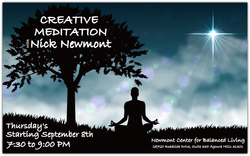 That is precisely the question that will be answered in this new Sentient Healing course by Nick Newmont. This class takes “The Psychology of the Chakras” and looks at it from the physical standpoint. We now know there are clients who seek the help of alternative healers instead of going to traditional therapists. This class will help you as an energy worker communicate and facilitate the mind-body-spirit connection for those clients who want to heal energetically and within. The electromagnetic energy generated by each chakra transmits negatively or positively into the body via the endocrine system. In a manner of speaking, each chakra is a metaphysical, electromagnetic gland. We will discuss the hormonal reactions created by each chakra and the effects of the chakras on specific body parts and organs. The handout will include the function of key body organs, the location in the body and the chakras each organ relates to. This workshop also includes demonstrations and practice in the healing rooms. As alternative healing techniques becoming more mainstream it is important to stay ahead of the learning curve as clients come to us before going to western medicine or traditional therapy. This class will up your game by increasing your knowledge and awareness of the body-spirit connection. I look forward to assisting on your path of healing enlightenment. How many times have you heard that statement? Would you like to learn to channel? If you answered yes to any of the above, this class is for you. If you say that you can’t quiet your mind, you are probably right. What are real and fake spirit guides? How can I better access my higher self to improve my life? This meditation to channeling ten-week series teaches breathing techniques and progressive relaxation to release stress. It serves as the foundation for spirit communication in advanced healing techniques. Channeling is a creative exercise which is activated in the right-brain. Many people have entered this class swearing they could not channel. Like many before, you will learn to channel for yourself and for your classmates. The benefit of this workshop is to learn to feel good on a permanent basis! What are planet retrogrades and how do they affect us? Do you suffer from HAP (Hysterical Astrological Paranoia)? Mercury retrograde is gossiped about casually over coffee like it’s the ruination of society. Poor little Mercury gets the blame for everything that goes wrong. There are seven other planets that reverse motion too. Find out in this fun and informative class on planet retrogrades. In this new class with Astrologer Nick Newmont we will look at your natal chart and discuss how many retrograde planets you were born with and how they affect your life. We will explore the meaning of each planet in retrograde motion. Just as important we will analyze the duration of each planets’ retrograde and how often they reverse direction. Did you know that Mars turns retrograde every other year? Why Does Mercury get the most blame? We will dispel the myths about Mercury retrograde and highlight the positive sides of all planet retrogrades. Therefore, we all can confidently navigate multiple retrograde periods, stay the course of life and advise our hysterical friends to calm down. I promise there will be some laughs along the way. This class is designed for the general-public. No prior knowledge of Astrology is necessary. Requirement: bring your best Mercury retrograde story. Do you want to know foundational numerology along with a proven compound system? How many times have you re-birthed? What is your personal year cycle? How did Nick predict 9-11and the exact day the Dow Jones Index eclipsed 8,000? ​In this fun workshop you will learn how to build personal profiles and predict timing. Nick will also demonstrate the technique of picking addresses, phone numbers and naming businesses. He will also cover compatibility. Pre-requisite to the upcoming “Crystal Newmerology” class. Throughout my twenty-plus years as a healer, clients have asked me, “What crystal is good for me?” My response has been “See what you are drawn to.” People normally find the right one using that method because the stone they choose applies to an issue they are currently experiencing. This is a new chapter in the Intentional Healing series. The aim of this workshop is to identify the numerological compound number of each crystal and create personalized chakra plates for you and you clients. This is allows us to obtain everyone’s vibrations via their numerological and realm and attach the identical crystal vibrations. This creates the tools for tuning in to oneself and staying in tune with oneself. Would you like to stay in tune on a regular basis? You can, and this is how. The vibrations of each crystal are pre calculated and are listed alphabetically in your comprehensive handout. This method allows to create one personal plate or if you choose, a plate for each component of your numerological realm: Birth Path, Environmental Influence, Conscious Desire, Subconscious Motivation, Dharma and Karmic Lessons. This is viable, accurate layer to applying crystals in your healing work or personal life. Thus when we feel we are off track and not feeling like ourselves, these plates restore the original vibration. And for those of you who want to take it a step further, I will demonstrate how to make a Personal Year Cycle plate. If you are wondering, the numerology of Sentient Plasma Quartz is 83/11...wow! I look forward to sharing this new class with you and of course, having fun. Each major chakra has an assigned presiding archangel and a corresponding colored ray of light. Some of these heavenly beings are not household names. Whether you are not familiar with them or nor call them in, they are there. In this new chapter of the Crystal Layout series, healer and channel Nick Newmont identifies these high angelic beings and demonstrates how to work with them. You will also learn how to work with each Angel’s heavenly light vibration and apply it to its designated chakra. Each student will get practice time to identify and to feel the difference between each angel’s vibrations. We will practice chakra breathing for preparing to work on clients. A detailed, comprehensive handout accompanies this class to serve as a guide and reference tool while performing the crystal layout.